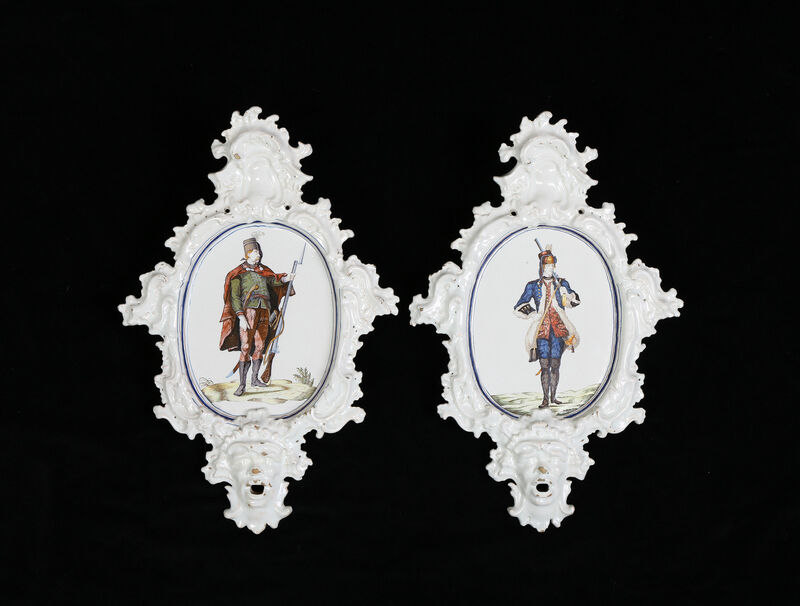 Painted in grand feu colours in oval panels within elaborate rococo scroll frames with standing figures of infantrymen titled on the reverse ‘Arquebuceros de Grassin Infanteria’ and ‘Croates de ynfanteria’. 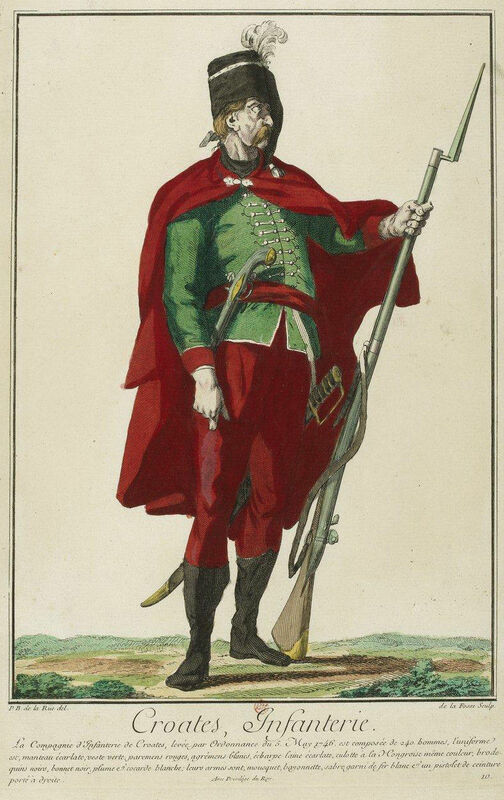 The ‘Arquebuceros de Grassin Infanteria’ or Arquebusiers de Grassin were from a French regiment raised on 1st January 1744 and absorbed into other regiments on 1st August 1749. They fought in the War of the Austrian Succession at the French victories of Fontenoy in 1745 and Rocoux in 1746 in the Austrian Netherlands. 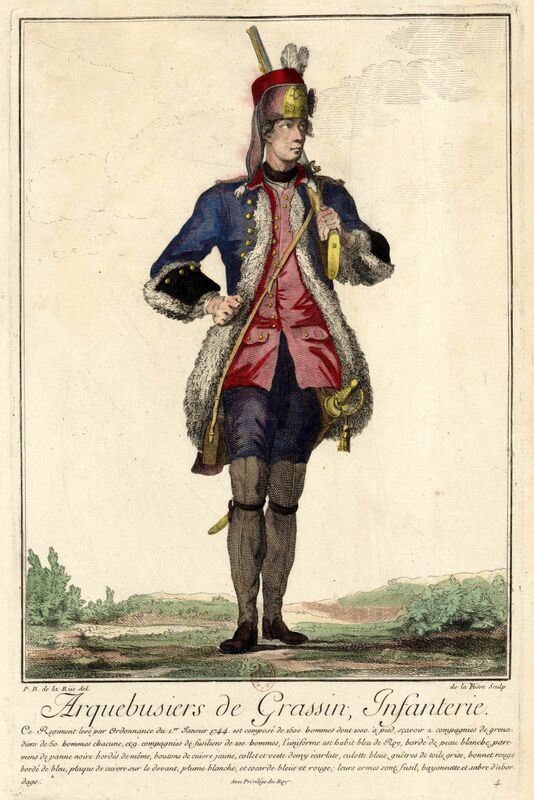 The ‘Croates de ynfanteria’ were a regiment of Croatian volunteers in the French army that existed between 5th May 1746 and 2nd December 1748. The images are taken from engravings first published in Paris in 1747 as ‘Nouveau recueil des troupes légères de France levées depuis la présente guerre’. These plaques were perhaps a special commission from someone who had served in these campaigns. No other examples are known. The Real Fábrica de Alcora was established by the Count of Aranda in 1727, the factory is notable for the very high quality of draughtsmanship, which is exceptional on tin-glazed earthenware. 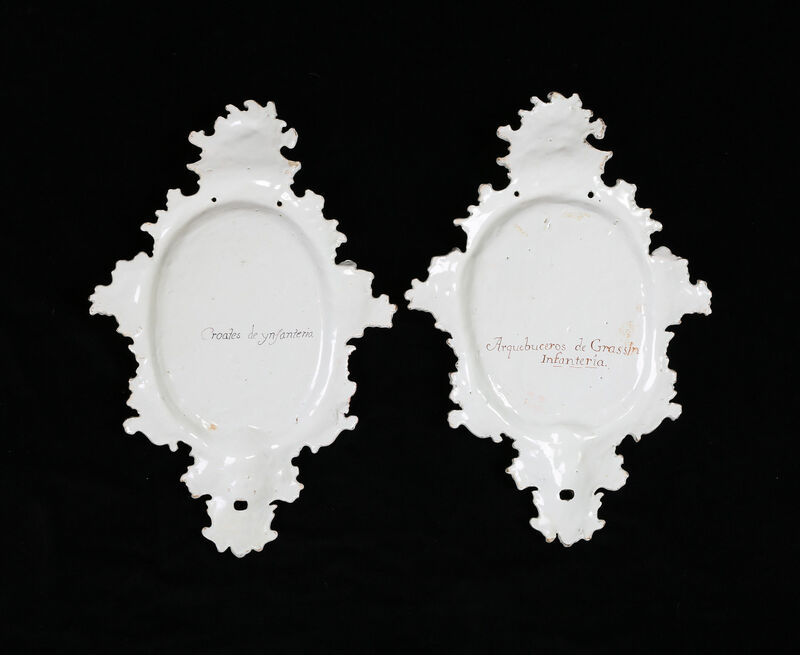 These plaques are from the Second Period, between 1750 and 1764, when the rococo forms were introduced after the publication of the new factory Ordinances in July 1749. The Count of Aranda was ambassador to France in 1773. 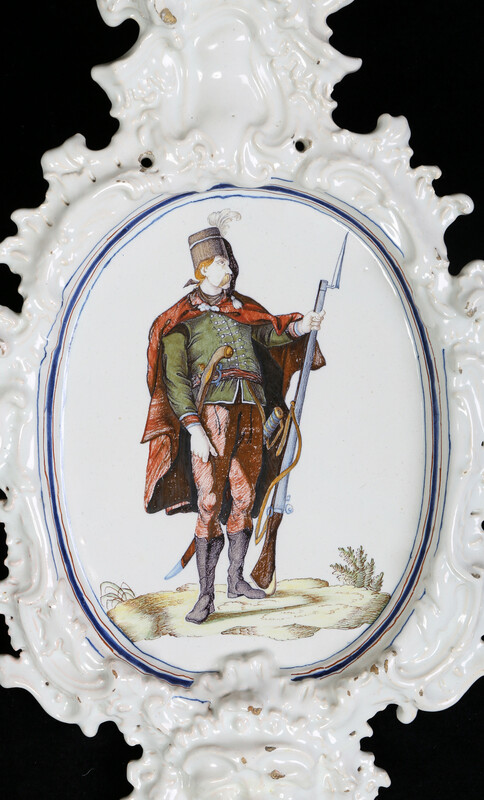 Antony Ray in Spanish Pottery, 1248-1898, London, 2000, p. 224, probably refers to these plaques, in a private collection depicting Spanish infantrymen, as dating from the period of the Peninsular War. In fact the soldiers depicted are not Spanish and date from much earlier. 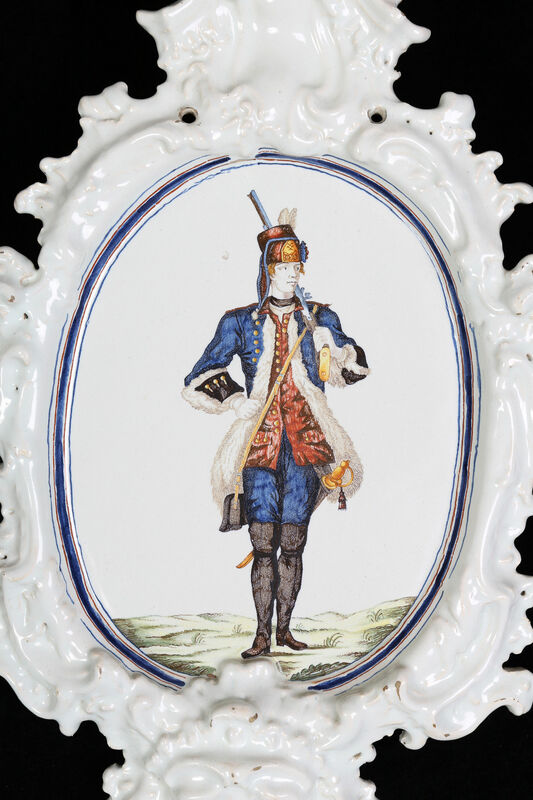 The quality of glaze, the palette and decoration is completely consistent with a date of 1752-64. Condition – The ‘Arquebuceros de Grassin Infanteria’ plaque has a small section of a scroll at the bottom neatly restuck. The ‘Croates de ynfanteria’ plaque: The bottom section of the mask below the mouth is remade with a break across the face of the mask and a small section of scroll restuck at the top.